If you love to climb and feel the rush of adrenaline, here is your chance to finally turn your passion into a full-time career. Rope access technicians are specialists in accessing high altitudes locations using rope and safety gear. This sort of access is required in rescues, for high level constructions, oil rigs, etc. The ability of a rope access technician to keep cool in strenuous situations and maintain the safety of the entire project is vital to their success. Do you have what it takes to become a rope access technician? To get certified at one or more of these levels, you will need to clear a final test. The assessment lasts for a day after approximately 4-5 days of training. It is meant to test the skills you have mastered over the period of the course. It is the way to show the instructor that you have what it takes to become a rope access technician who will not endanger your own life or the life of anyone around you. With a good amount of preparation, lots of practice and a good fitness program, you can give yourself the right leverage to clear this assessment with flying colors. There is some amount of formal training involved before you can be considered as industry ready. International Rope Access and Trade Association (IRATA) and the Society for Professional Rope Access Technicians (SPRAT) are two major internationally recognized institutes for Rope access training. IRATA teachers must meet certain criteria and such is not the case with SPRAT. Both IRATA and SPRAT reputable programs, but SPRAT has a strong North American reputation while IRATA has world-wide recognition. While these are US based organisations, you can always check for Indian institutes that offer the same training or its equivalent. As a Pre Course preparation, do some warm up (gentle exercises) for a week of vertical exercise. You don’t need to do anything vigorous as a pull-up. The IRATA assessor marks your assessment day. These assessors are in-date level three certified with dozens of experience in the industry. Witnessing every form of practice be it good or bad, they have experienced every excuse for mistakes. Their main concern is in the belief that people can turn up to work with a safe approach. Feel free to question and be questioned from these assessors with up-to-date technical information. You will be asked questions because the assessors want to know if you understand the reason behind each manoeuvre. They’ll point out important minor faults like un-loved screw-gate so you know where to improvise. Only two minor discrepancies are allowed and if the third one occurs, it means a fail. Also, you need to keep a back-up device. Being careless with its positioning may mean a minor discrepancy, and if you forget it by letting it hang at your ankles, that will lead to a fail. The main point to focus on is not to finish up hanging from one point of contact, or one rope. Keep this in mind in every single operation at all costs. As Level 2 or Level 3 technicians, you may be asked to do things you haven’t done in your training, but in Level 1, these will only ask you things you have done in training. Don’t be distressed thinking that you’ll be asked to operate under crazy time pressure because that isn’t the case. Your assessors will only try to observe if you can apply your learned principles to a slightly novel problem. You will be told then and there in case you fail, so don’t give up on hope after you notice that you have done a few blunders. Until they tell you, you are in the game. You need to put together your harness rigs for safety. So, practice doing that a couple of times before. Also, since you’ll be asked to fault find if your harness is dodgy, you should so practice that too. You’ll be required to ascend sets of ropes at the start, regardless of assessment level. Just go at your own pace without panicking. Avoid over-focusing during each activity. Additionally, make sure that you do the more complex stuff in methodical stages and before you operate a new system, you must do a ‘function check’. When in a difficult situation, think about something completely different like a romantic incident, fishes or your favorite things and then re-examine the system once again. It is important to check your screw-gates before each manoeuvre and then see the two separate connections you have and count them, and be ready with the third. Avoid the critical pose of two or three connectors to one anchor. Keep in mind the casualty care and the sequence of responses chosen. Keep your ropes and the casualties ropes out of the way. No matter how slow you are in your final descent, if you have any type of backup device that could steal the glory. You can enter rope access field now. You could be anywhere now from huge bridges to oil rights, skyscrapers to cliff face stabilizations, and anywhere that required working at height. ● Level 1: Level 1 training is recommended for those with little to no Industrial Rope Access experience so that they are certified to perform simple rescues. ● Level 2: A level 2 personnel who has logged 1000 hours of rope access work together with one year of work experience can go in for level 2 training. ● Level 3: A level 3 person shows high technical skill at conducting rope access while maintaining site safety. They also possess advanced rigging and rescue knowledge, hold a first aid certificate, and have knowledge of legislation and IRATA training. working in confined spaces (e.g. water tanks, cooling towers, boilers and shafts)’, non-destructive testing (NDT); geotechnical work (e.g. rockfall netting, rock demolition, and soil stabilization); facade maintenance (e.g. building maintenance and repair); rigging services (e.g. marketing, promotional, and seasonal displays in public spaces); working on oil rigs; window cleaning in high-rise buildings; and also renewable energy (e.g. wind farm maintenance and repairs). How safe are these jobs? For the inexperienced, working at heights or in confined spaces can be dangerous. In early 1900s, rope access technicians had to complete their work using the Bosun’s Chair, i.e, a plank of wood that is used as a seat at the end of a rope rather than the the safety harnesses used now. The technicians faced a far more dangerous situation at that time. However, today, rope access technicians benefit from the excellent safety process – just as we do here at Mekanchi Global (with a 100% safety record). 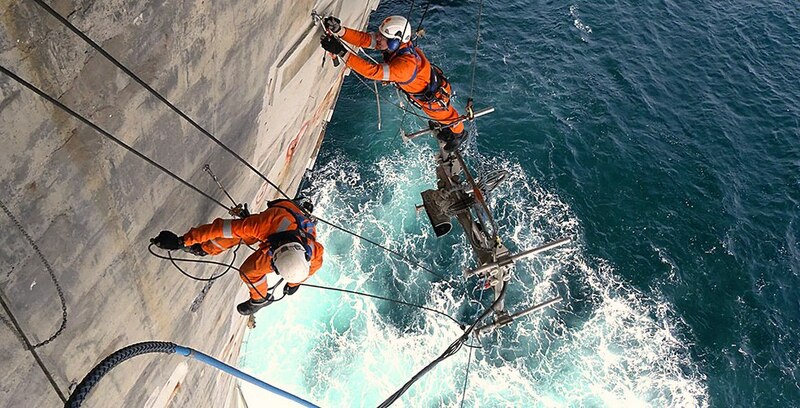 Mekanchi Global offers Rope Access enabled services (Industrial services and NDT), Non-Destructive Testing Services, , UAV Enabled Inspections, Dimensional Inspections, Engineering Consultancy and Trainings Programs through a diversified team of specialists and industry experts whose collective experience totals to more than 150 years. By joining forces with Mekanchi Global, you are giving yourself a competitive advantage over other industry entrants, and international opportunities for work exposure. Contact us today to learn more about our rope access services on 9999805500 or send us an email at info@mekanchi.com.